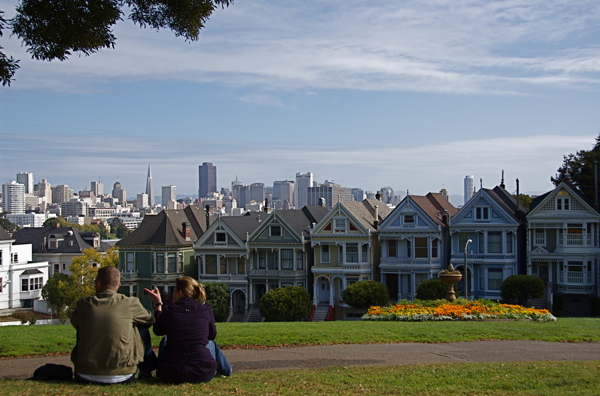 The Victorian houses of Alamo Square in San Francisco. 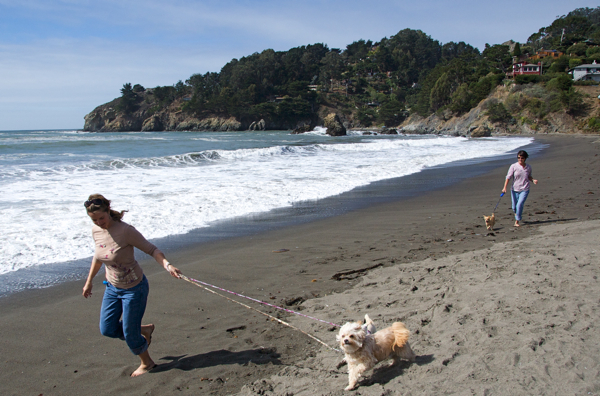 Two locals walk their dogs in the hilly oceanside community of Muir Beach, Calif. When I visited New Orleans last year, I went about my adventure as an enthusiast in an attempt to blend in and get a sense of what it's like to live there. I got to know the local people, which eventually led to my introduction to Brad Pitt, who was in town to do some reconstruction work. I left the Big Easy with a great sense of achievement, almost as though I had made some friends, even if it was for only a few days or a couple of minutes. But I also felt that I had missed something. There was much to be experienced in New Orleans that I skipped because I was too busy "blending in." I didn't tour the bayou. I didn't get any sort of Mardi Gras experience. I didn't eat any gator. Until my San Francisco trip, I thought my New Orleans strategy was the only way to go about tourism. It's probably because it's cheaper. And people who know me know that I'm cheap. But my friend, whom I've known since freshman year in college, opened my eyes to a different approach: making sure you do the things you've never done and see the things you've never seen, before leaving a place you may never return to. I saw the Golden Gate Bridge. I learned how to use a Segway. I threw myself into an Alcatraz cell. Several times during the stay, I said, "I feel like a tourist," and then my friend responded, "That's because you are a tourist." I think I finally came to grips with that on Day 3. So on that last day in the city, we had to ask: What was the final thing we need to do or see before leaving? 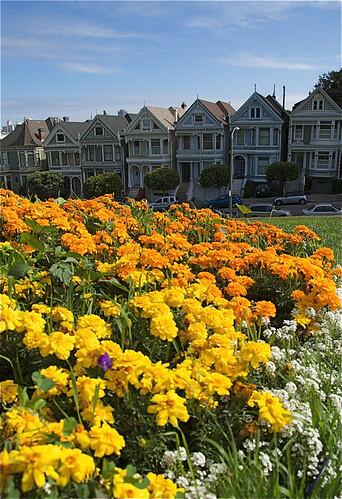 It was most definitely to visit Alamo Square, where the view of the Victorian "Painted Ladies" has been featured on countless postcards and movies and seen in TV shows such as "Full House." We found a parking spot beside one of the houses and climbed the small hill. Being in the heart of the city for a few days, then stepping back and taking an overall look at where I had been treading is an amazing experience. Only from this perspective was I able to grasp the rugged beauty and uniqueness of this city. Luckily, my friend is a patient person. He waited as I pointed my camera this way and that way to get the right frame with the seven Victorians in the foreground and the skyscrapers behind them. A British family, left, walked in front of me and spoke in a pronounced, almost scripted tone. That's when I realized they were being filmed, probably for some travel show in England. "Thank you, San Francisco," the man said as he walked away. We left the city via the famous U.S. 101 and the even more widely known Golden Gate Bridge. I hadn't seen the open Pacific Ocean yet, so we headed for Muir Beach, just north of the city. Having once lived in the surfing capital of the East Coast, Cocoa Beach, I can say that the surfers in Florida would be jealous of the large waves in California. But, on other hand, they'd be less impressed with the temperature of the water. My friend waded into the rough Pacific as I waited far away from the frigidness. But I had that feeling again as though I was missing out. If I didn't partake, I couldn't walk away from the beach and honestly say I've felt the cool water of the Pacific Ocean on my legs. So I took off my shoes and waded out. 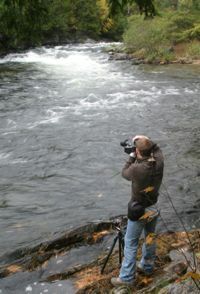 The water was soon above my knees, soaking my jeans. 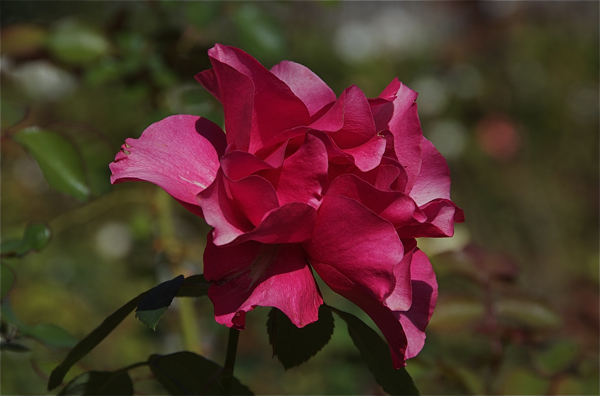 We then made our way to Mare Island in Vallejo, where my friend's grandfather, a Navy captain, had been a commander for five years in the 1980s of a now-defunct shipyard. The barracks were covered with graffiti. Windows were broken. Grass was taking over the roads. The city of Vallejo is trying to develop the grounds, attracting businesses to locate warehouses and large-scale operations on the site. Some parts have been reserved for preservation, including the museum dedicated mostly to the former civilian employees of the shipyard. 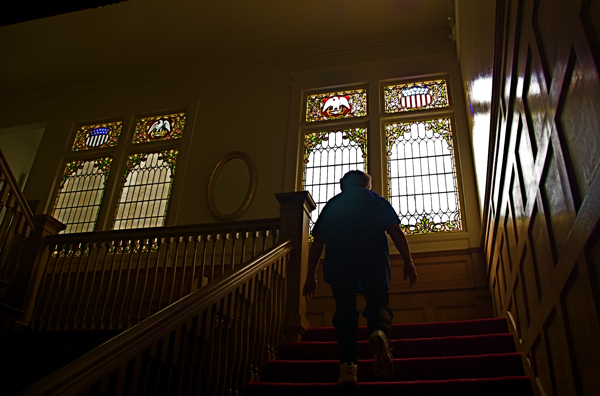 Joyce, our tour guide at Mare Island Naval Shipyard, leads us to the second floor of the commander's quarters. 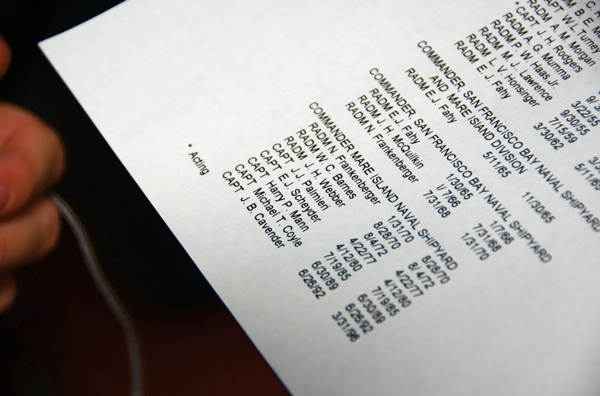 My friend looks at a list of commanders, including his grandfather. A volunteer at the museum, Joyce, greeted us when we arrived. She showed us the commander's quarters, where my friend's grandfather had stayed. Because we were "special" visitors, she said, she showed us the third floor and the basement of an old building once profiled on the History Channel and used for a scene in a movie, the name of which I can't quite remember. Anything exclusive is worth doing, so I'm glad my friend has connections. We arrived at our Napa base, The Chateau Hotel, late in the afternoon. The first thing we noticed was how vacant the building was. Its location was perfect: in the north part of the city, close to the wineries along State Route 29, the main road through Napa Valley. The accommodations were adequate, certainly more so than at the Civic Center Inn in the Tenderloin of San Francisco. And there was even a continental breakfast. How can you argue with bagels, danishes and corn flakes? It was harvest time for the vineyards, making it peak tourist season. So we can't really explain why the hotel and wineries we visited during our stay were quiet. Maybe it's always like that. Maybe we just picked the right weekend. Or maybe it's the recession. We quickly checked into the hotel, then headed to Domaine Chandon, a winery not five minutes away that's famous for sparkling wines. 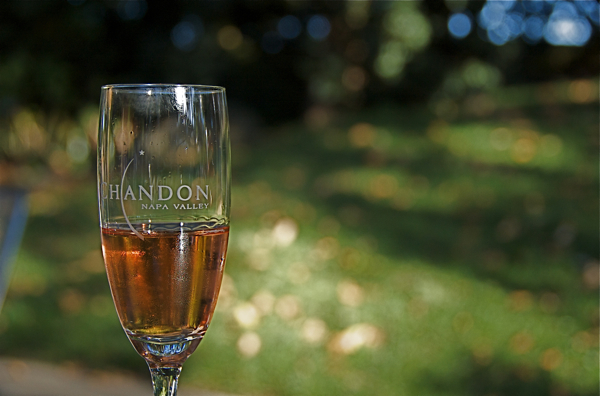 I had never tasted a sparkling wine I liked until tasting three of them at Chandon. 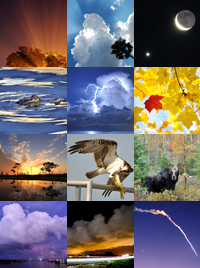 Maybe it was the atmosphere. A French singer with an accordion filled the outdoor patio with a sophisticated air. Nearby, a man shucked oysters. My friend and I ate "artisan" cheeses as we tasted wine. I had the $16 "prestige tasting," which included the etoile brut, the reserve pinot noir brut and the etoile rose, which was aged five years and featured flavors of plum, raspberry, nutmeg, candied ginger, truffle and cocoa. My friend and I laughed with the people at the table next to us when we saw a largely pregnant lady drinking a glass of red liquid. Maybe it was grape juice? And to think, I probably would have never had this experience if I didn't have a friend alongside me. 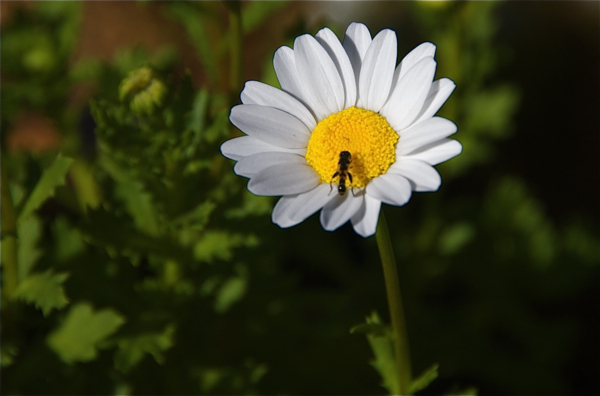 A daisy in the flower garden of the commander's quarters at Mare Island. 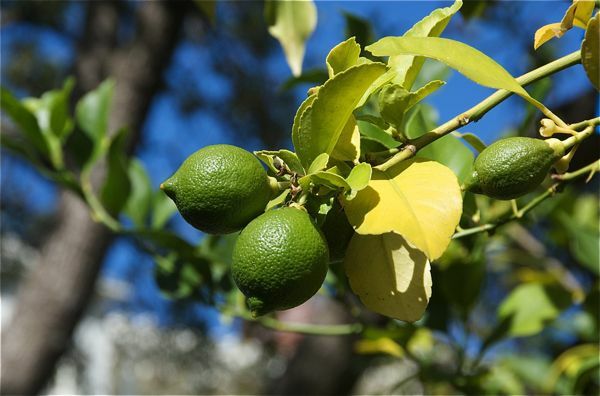 Unripe lemons hang from a tree at the commander's house. My first taste of Domaine Chandon's etoile brut. The wine was described as "a bouquet of almond and honey [that] leads to flavors of citrus and ginger with a soft, creamy structure."